Live Healthy Live Well (LHLW) lessons and challenges educate consumers on nutrition, fitness and other wellness issues, increasing awareness and adoption of healthy lifestyle behaviors, and ultimately reducing health care costs. Challenges are FREE six week on-line email experiences designed to help participants improve their health by encouraging physical activity, enjoying healthy foods, and practicing sound activity suggestions. 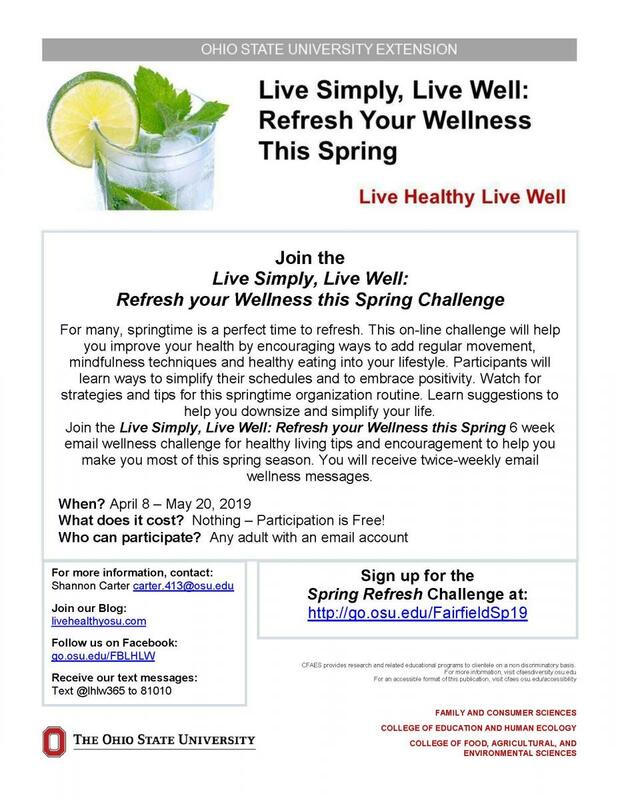 Those who sign up will receive two weekly e-communications from Ohio State University Extension containing research-based nutrition, health and fitness tips. Tracking logs will be available for download to help participants record their progress. A pre- and post-online survey will gather comments to improve future challenges. All collected data will be kept confidential. If you've participated in our challenges before, we'd love to hear about your challenge highlights, ideas/activities you've found most helpful, and suggestions for improvement (email Shannon Carter at carter.413@osu.edu). Be Well! Unable to participate in our most recent challenge? Join future LHLW Email Challenges! All challenges run for 6 weeks. If you are interested in participating in a future email challenge, contact Shannon Carter at carter.413@osu.edu and we'll add you to our challenge invitation list!